I saw this recipe for bulgogi which is Korean barbeque on PurpleGirl’s blog sometime ago and I’ve been wanting to try it for sometime, but haven’t found the right cut of meat until recently. However, by this time, the weather has turned cool, and it just is not conducive to cooking outside anymore. Plus, as usual, I didn’t have a whole lot of time to get dinner on the table, so this is my version of the Koreal style barbecue, stovetop. I used a pressure cooker to hasten the cooking time even more. Layer the ribs in the pressure cooker and pour the ingredients above over the meat. Seal, and pressure cook for 35 minutes. After the meat is tender but not falling apart, lay them on an ovenproof dish and put in a 400 degree F oven to caramelize, about 15 to 20 minutes. In the meantime, take the remaining liquid in the pressure cooker and cook additionally until it is reduced to half and has thickened. 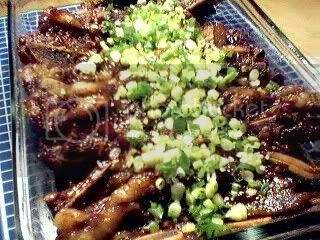 Remove the pan from the oven and pour the sauce over, and sprinkle with chopped green onions. Serve over steamed rice. God bless you for this recipe! I finally have a chance now to try this. Thanks! Yes JMom, malinamnamyum! It’s so good over rice w/ the sauce drizzled over. Thanks for posting, esp. a recipe I can use w/ p. cooker. I followed the recipe exactly…It got so tender and the flavors permeated the beef really well. (We were supposed to have this Sun. but the Dad wanted bistek and he “swayed the votes”…)Talap! Drstel, did you cook it yet? Can’t wait to see how yours turns out. TingAling, sabi sa yo, there’s something in the blogging air that makes us seem to cook similar dishes at the same time. Food ESP ba? You even had mango cheesecake, almost like my peach royale ala sassy. Celia K, sorry I’ve never tried making kalbichim before. However, found this korean site http://www.visitseoul.net/english_new/index.htm and they have some pretty good korean recipes. Still now Kalbichim though. I’ve been wanting to make this, it’s a good thing you and Ting-aling posted recipes. Thanks !! Btw, do you have a recipe for Kalbichim? Geez, I cooked this too but blogger was having temper tantrums so I wasn’t able to post as often..
JMom, I missed this post yesterday. Takbo na ko sa grocery so I can make this! Mouthwatering ….